"This quick salmon dish is perfect for a weeknight dinner. Serve with a side of sauteed spinach and a glass of pinot noir." Preheat oven to 375 degrees F (190 degrees C). Line a baking sheet with a piece of aluminum foil, and spray with nonstick cooking spray. 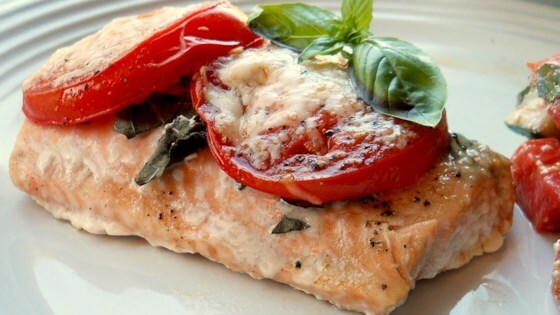 Place the salmon fillets onto the foil, sprinkle with basil, top with tomato slices, drizzle with olive oil, and sprinkle with the Parmesan cheese. Bake in the preheated oven until the salmon is opaque in the center, and the Parmesan cheese is lightly browned on top, about 20 minutes. Pretty yummy...tastes like Olive Garden meets Red Lobster. I chopped a couple cloves of garlic and added it to mine. I used fresh basil leaves and layered them under the tomato slices. It made a pretty presentation and the family enjoyed it. This was delicious! Perfect for a quick meal. I ended up using canned tomato rather than fresh, since it was what I had on hand, and the juices kept the salmon very moist. Great, quick recipe.